I don't know about you but i've never met a person who doesn't like popcorn. They are a perfect snack for a variety of occasions: when you have guests visiting, while watching a movie, series or sports, while walking through the city or nature. Have you ever made popcorns a for movie night with your family and their taste wasn't as good as the ones in movie theaters? How you ever wondered what is the secret of delicious popcorn? Is it some specific type of butter? Or maybe salt or other seasoning? The specific type of topping? Or the way they are popped? No matter do you like them salty, spicy or sweet, the key to delicious popcorn is a good popcorn kernel! My family loves eating popcorn too, so I tend to pop them often and, if I may say, I became quite good at it! In this article I will give you my experiences about which popcorn kernel brands i use, how I prepare them and some other information that might interest you when picking the best one for your taste. What To Look For When Buying Popcorn Kernels? There are several types of popcorn kernels, but the two main types are butterfly and mushroom kernels. This is a division by shape and the difference occurs while heating up the kernels. The shape of butterfly popcorns are irregular, with many “wings“ protruding from kernels, while mushroom popcorns are rounded, ball-shaped, less fragile and larger. The mushroom type is, in my opinion, better if you like some kind of coating on your popcorns (like caramel, cheese or chocolate). Butterfly popcorns are more spread on the global markets, and this type is used in movie theaters and stadiums. Popcorn kernels can also be divided by color and size. By color they can be white, yellow, blackish, blue, purple, red and green and by size they can be small (Baby white, Baby yellow, Tender & white, Vintage red, midnight blue and Lady finger ), medium (Big & yellow, Sweet baby blue, Purple) and large (Extra large caramel, White meadows). You can pop popcorn on the stove using a cooking pot or Red Copper frying pan. Pour the the oil into your pot or pan and heat it on medium high heat. Insert your popcorn kernels, cover the pot, and wait until all (or most of) the kernels pop. You will know it's over when the sound of popping stops. Dump the popcorn into a wide bowl and add butter or salt if you want (in a preferred amount). The most often way of making popcorn in a microwave is to put a paper bag (paper lunch bag or the bag you get while buying kernels) filled with popcorn kernels in a microwave and heat it on maximum power for about 90 seconds. You need to add oil and roll the bag shut if you are using your own bag. Remove the bag form the microwave, open the bag and put popcorn in a bowl. Add salt or some kind of topping if you want and enjoy! Popcorn in a bowl is an alternative method of making popcorn in a microwave. It is very similar to the paper bag method but instead you need a microwave-safe bowl. Hot air popper (popcorn maker) is a machine for popping that blows hot air through holes in the container that holds the popcorn. They emerged in the late 1970s, and small-scale air poppers for home use are becoming more and more popular in the recent decade. Your popcorn is ready! This way of making popcorn is much healthier because it doesn't require oil. There are other ways of making popcorn you can try out. Method with electric popcorn maker is similar to stove top method, you can use electric skillet, or even t﻿he﻿﻿ electric ﻿﻿grill or campfire. It’s up to you to decide which method you find the most suitable! There are plenty characteristic of popcorn kernels which can be taken into consideration when choosing which one to get. What is the best way to pop them? The most important thing for me is that the popcorns are organic, gluten free, non allergenic, fresh and low in fat as much as possible. I also prefer non-GMO kernels with little or no chemicals at all. All in all, I like them as natural as possible! Other things that can be important for you are the presence of cholesterol, proteins and fibers. Some of you might be interested are the kernels Kosher, vegetarian or vegan. There is an old Latin saying: “About tastes, it should not be discussed“. I will just say my family and I like our popcorn buttery, tender, salty and topped with cheese! We already talked about methods of making popcorns, and you probably have your favorite one. That is fine, because every kernel can be popped on all of those ways. But, some kernels are better when prepared in a certain way, they just tastes better! 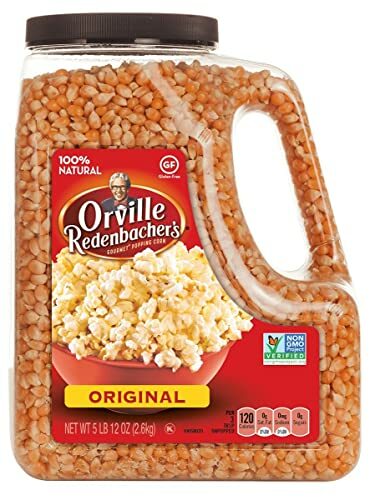 One of the most popular popcorn kernels in the USA. My sons love it and I have been buying this for years. I’ve never had problems with preparing them, they always turn out fluffy and delicious! This is a 8 ounce pack and it comes with a pack of buttery oil. If you ever ate popcorns in theaters or sport stadiums you've probably already tasted them. Just to mention that the company that produces them claims that these popcorns are the best tasting popcorns in the USA! Popcorn, coconut oil, beta carotene, natural and artificial flavor, FD&C Yellow #5 and 6. Non-GMO, they are Diacetyl and Gluten free! Bob's Red Mill popcorn kernels come in a box of four bags of 100% vegetarian whole grains with no added salt or oil. These popcorns are excellent source of dietary fiber. The producers say that kernels are carefully selected from the very best crops of corn. They are butterfly shaped, white variety of hulless kernels. They are best to be popped on the stove or in the microwave. 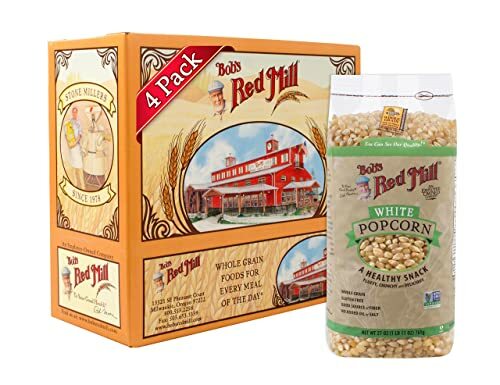 Currently, Bob's Red Mill White Corn Popcorn can be shipped only within the USA. It can be stored in refrigerator, freezer or in air tight container. A healthy, low fat, whole grain, mushroom-shaped popcorn kernels for every occasion! 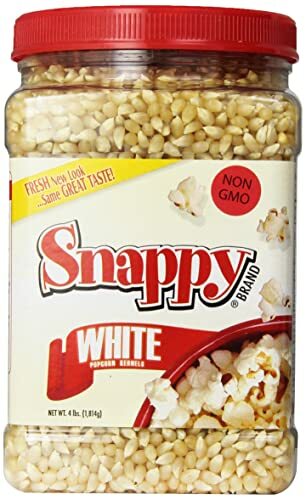 With the tradition dating from 1940s, Snappy White Popcorn are, in my opinion, one of the best popcorn kernels on the market. Almost all kernels pop every time and the flavour is just great, the popcorns are literally melting in your mouth! They come in one 4-pound jar of fresh white kernels, and they can be popped any way you like! I prefer microwave popping because it is the quickest and the healthiest way. These are tasty butterfly popcorns with crispy outside and a tender inside. They are 100% natural, round, yellow kernels. They are packed in a huge jar containing 5 lb, 12 oz of 100% whole-grain kernels and they are meant to be prepared and eaten all at once. I prepared them on many ways: on the stovetop, in an electric popper, in hot air popper but i must say that I got the best results (and flavour, of course) when popping them in the microwave with a paper bag. 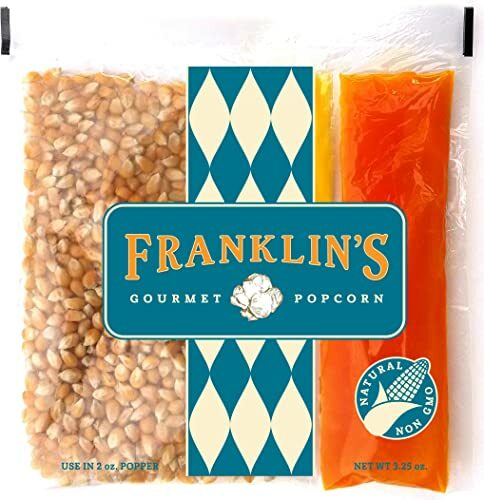 Franklin's Gourmet Popcorns are an organic popcorn kernels, with 100% coconut oil and seasoning salt and they taste just like movie theater popcorn! They are sold in pre-measured packs weighing about 5.8 pounds. These kernels don't pop up as big and fluffy as some of the other popcorn brands, but it's worth the sacrifice because Franklin's Gourmet Popcorn is non-GMO product acquired from corn that's grown by small family-owned farms. It is recommended to be made in a whirley pop, fryer pot on your stove top, or a kettle popcorn popper. 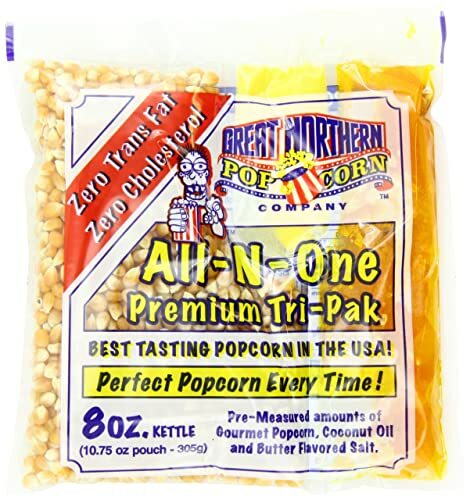 Although I enjoyed in every one of those popcorn kernels, and I’m pretty sure I’ll enjoy in all of them again, my favorite is definitely Great Northern Popcorn Premium. My family loves them, they are easy to make and they have never disappointed me. Great Northern Popcorns are healthy, non-GMO, gluten, cholesterol and trans fat free and non-allergenic. You can prepare them any way you like and they will always turn out delicious and soft. Great Northern Popcorns can be stored for later use and they will always turn out fresh. Do you have a best of list for kernals for kettle corn? I’ve tried these five so far, Amber. What did you use so far? Well, I haven’t tried any. I was given a, what I guess you would call commercial, kettle corn set up. A 60 or 80 quart kettle with everything needed to prepare the kettle corn, aside from the grocery products. I have been shopping around online and found pretty good prices. Just not sure which brand of kernals to go with and what oil to use as well. If you have any knowledge or suggestions, I would appreciate it! These are some really good Pop Corns, will try out all. It looks nice and yummy. I’m glad you like it! Let us all know which ones you like the best! That’s good, because no popcorn is a GMO.